Would You Like to Learn How to Play ALL of Your Favorite Songs Quickly and Easily Without Suffering Through a Bunch of Boring and Unnecessary Drills? Can Be When You Learn Certain Progressions the Right Way! Or imagine pulling out your guitar when you are at a party with friends or relatives and have them gather 'round' as you play their favorite tunes. ... Wouldn't That Be AWESOME? Well, go grab your favorite acoustic or electric guitar because you are going to have a BLAST when you discover that you DON'T have to suffer through boring and ineffective practice drills in order to play ENTIRE SONGS . . . complete with your own creative embellishments! When you master a small handful of chords, and when you learn them in the way that we teach you, you can play virtually any favorite song you can think of! Since you are one of our valued email subscribers, we've decided to release this package with a 48-hour "FLASH SALE" discount that slashes a full $230.40 off the regular price! Check out the details below or grab your copy right now. 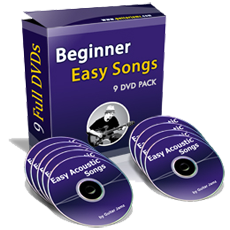 "Beginner Guitar Lessons DVD Bundle"
We have put together a massive 3-DVD set of some of the most popular chord progressions that are used in hundreds and hundreds of popular songs. It's not an exaggeration to say that there's almost no popular guitar song written in the last 75 years that you won't be able to play somewhat after learning these progressions. When you learn them, it will unlock the door to you having a great time, impressing your family and friends without endless hours of practice. This 3-DVD set contains almost four hours of a wide range of styles and rhythms. Each lesson contains a detailed explanation of strumming and timing in a fun, cool way. These guitar songs can be played anywhere, around the campfire at a beach, barbecue, or an informal party with friends. We break down these songs for you in a unique, entertaining style. Applying simple techniques with real time practice is one of our trade secrets to unlocking your potential to super fun guitar playing. This super effective 3-DVD set includes the acoustic chord progressions of nearly 24 songs. Tips and Techniques: You'll learn insider information that will allow you to quickly add embellishments and percussive rhythms to make your acoustic guitar come alive. These chord progressions are used in soooo many of your favorite songs! You will also learn a bunch of cool techniques that will wow your friends ... and yet they are surprisingly easy to learn! You will learn some amazing bar chord techniques that will bring an added dimension to your songs. These 3 DVDs amount to nearly four hours of total learning time. More chords! More songs! More fun! More progress for you! This 3-DVD set contains 31 awesome song lessons, which cover a wide range of styles and rhythms. Again, these represent some of the most popular chord progressions in history used in many hundreds of songs over the decades. When you learn them, it will unlock the door to you having a great time, impressing your family and friends without endless hours of practice. Each lesson contains a detailed explanation of strumming and timing in a fun, cool way. 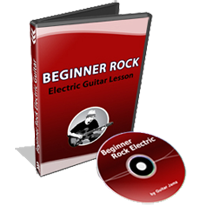 In this Beginner Rock Electric Guitar Lesson DVD you will have a blast and with only one finger you can start playing music right away. We will talk about amps, guitar tuning, and you'll also learn simple and fun rock riffs. You will learn the insider tips and tricks that will get you playing faster than you ever thought possible. This DVD includes 90 minutes of epic guitar instruction. We will talk about amps, guitar tuning you will also learn simple & fun rock riffs. You will learn the insider tips and tricks that will get you playing faster than you ever thought possible. Our beginner series is designed for anyone ranging from someone who has never touched a guitar before ... to students who may have played for years but never quite mastered the correct techniques to make the acoustic guitar come alive. You will learn various strum and rhythm patterns. You will learn several popular chord progressions, which is just a fancy name for a few simple guitar chords that make up a song. You will be encouraged with practice exercises and taught several styles of acoustic guitar playing and have a lot of laughs along the way. 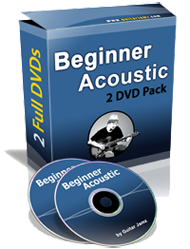 The next DVD in our acoustic beginner series takes off where DVD 1 ended. You will learn even more guitar chords and progressions, which makes practicing the guitar something you will look forward to each day. We even tell you how much to practice, what to practice, and we also delve into some basic music theory — and we even find a way to make THAT fun, we promise! This DVD also covers power chords and bar chords. Bar chords open up a whole new world of songs to you. We break down bar chords and you will have a blast. We then sneak in some more music theory to help you really understand the power of the guitar and how to harness it. Now at the 77% discount! NOTE: Since supplies are limited at this low price, this is a temporary special offer and will be taken down without notice at any time. Grab it now to lock in your huge savings! You can now add this all time Blues classic to you bag of Blues tricks. This DVD includes Nearly 90 minutes hours of epic guitar instruction. You will learn the insider tips and tricks that will get you playing Mustang Sally faster than you ever thought possible. We are going to teach you the funk concepts, techniques, riffs and patterns we have learned from some amazing funk players. You are going to bust out some funky chord voicings, funk syncopation, toe tapping funk rhythm grooves, 16th-note strumming, mind blowing percussive muting techniques, and loads of funk rhythms you have heard in many all time funk hits. This 90 minutes DVD is loaded with tips and tricks to let you get that funky music out. The Country Guitar Lesson DVD is nearly 2 hours jam packed with tons of cool country guitar styles and rhythms. Bob Ryan takes you on a guitar journey with a bunch of cool techniques such as chicken picking, arpeggios, palm muting plus a ton of country guitar lessons by the top country guitar players. Learning different guitar styles keeps your playing fresh and can inspire you to new level of guitar playing. This downloadable guide will help guide through your Beginner guitar journey and it's loaded with important information to help you learn the guitar. Take your guitar playing to places you never thought possible. We give you a full "12 Month No Questions Asked" return policy on any of our DVDs. Put them to practice and watch yourself playing guitar and having fun in the shortest amount of time possible. P.P.S. 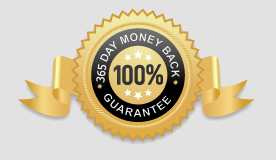 Remember, this 77% discount is only temporary. It's ending in just a few hours. We simply can't leave it up any longer than that. Take advantage of this "Flash Sale" while it's hot!